Important Note: As usual when it comes to such topics, I decided to reserve all rights when it comes to the photographs presented in this article (other pictures that I publish on this blog are licensed under creative commons), as I’m wary that their use could be instrumentalized for political ideologies with which I fundamentally disagree. If you would like to use them, feel free to send me an email to ask for authorization (info.funambulistATgmailDOTcom). 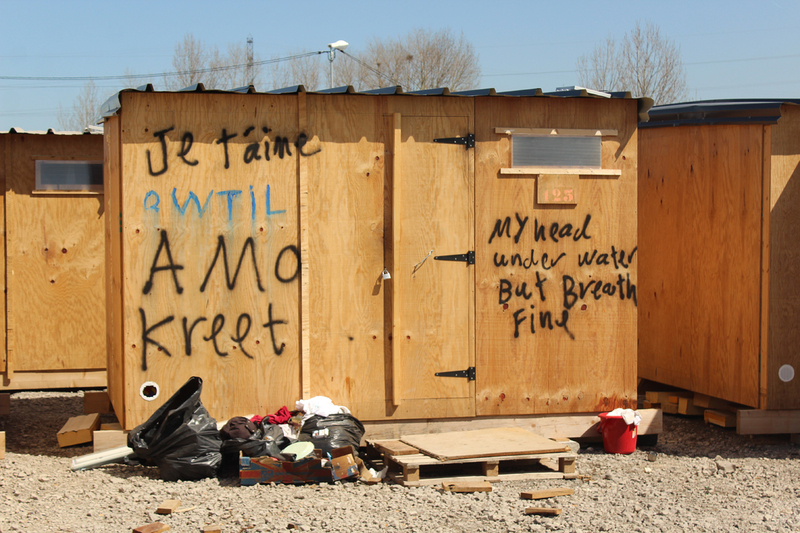 I drove back to Grande Synthe and Calais yesterday, in company of friend Merve Bedir (listen to our conversation for Archipelago) in order to document the new refugee camp of Grande Synthe (see below), as well as the massive demolitions that reduced Calais’ so-called “Jungle” of half its size a few weeks ago. Merve and I have agreed to both establish a report for The Funambulist insisting on our subjective vision of this visit during which we saw the same things but, necessarily, from two different points of view — the photographs we took bring an additional layer of subjectivity to the texts. 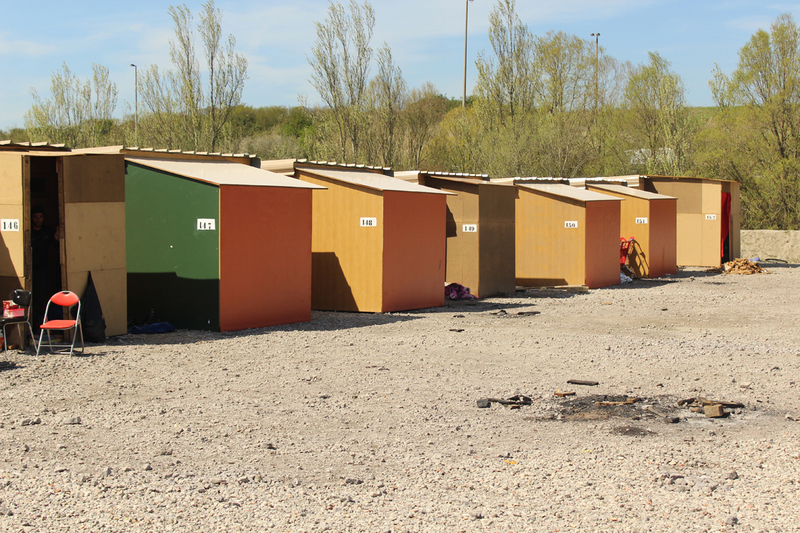 This article is therefore specifically dedicated to the comparison of the two official camps that have been built in Calais and Grande Synthe. The reason for this is that both materialize into architecture a governmental (whether national or local) political program in which migrant and refugee bodies and lives are the object. Although this article will be constructed in a comparative, and therefore negotiative, mode between both camps, one should not forget the fundamental common point of both sites: the fact that they are and remain camps and, as such, an extremely problematic architecture/urbanistic typology, as we will see in the conclusion. Distance between the camp in Grande Synthe and Dunkirk’s port: 11Km. Distance between Calais’ “Jungle” and Calais’ port: 4Km. Distance between Calais’ “Jungle” and the entrance of the Channel Tunnel: 15Km. Distance between both camps: 34Km. 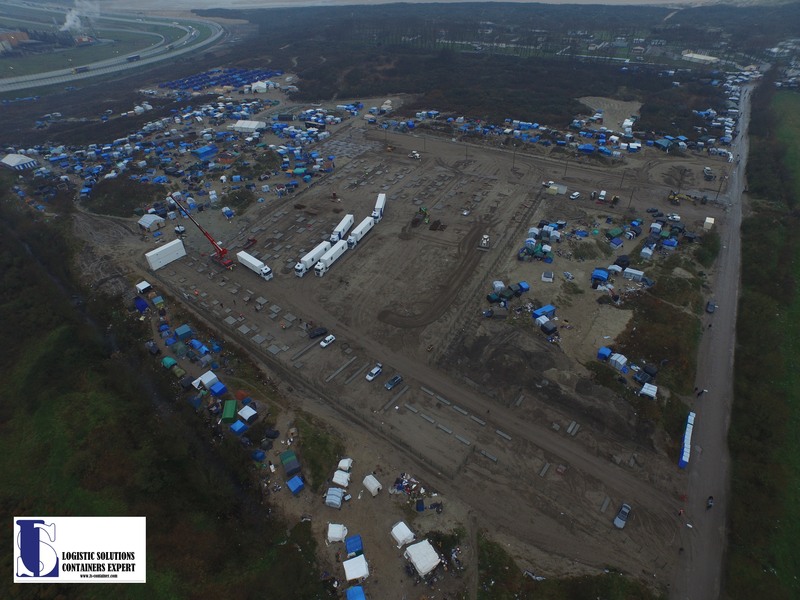 Photograph of the camp’s construction in December on Logistics Solutions’ website / Please note that only half of the “Jungle” (the one that was not demolished in March) is visible here. 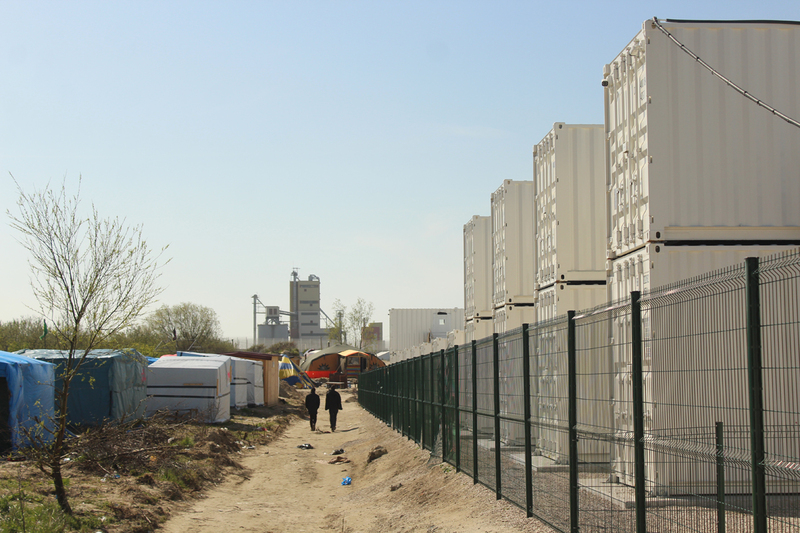 I have already written twice (see first and second articles) about the container camp built in the middle of Calais’ “Jungle” that, as such, had necessitated the demolition of a mosque and other makeshift dwellings in order to be built. 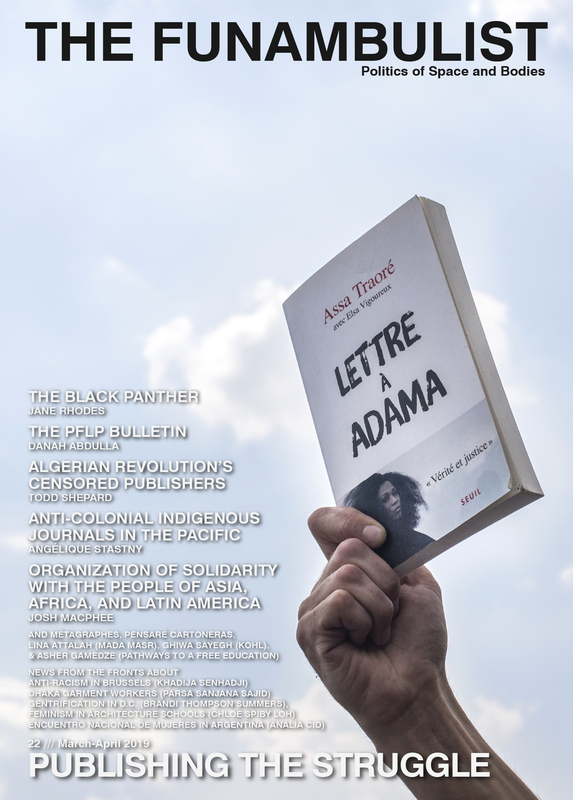 The forthcoming fifth issue of The Funambulist (May-June 2016) also counts an article on the question of racism in relation to this camp, written by Miriam Ticktin. 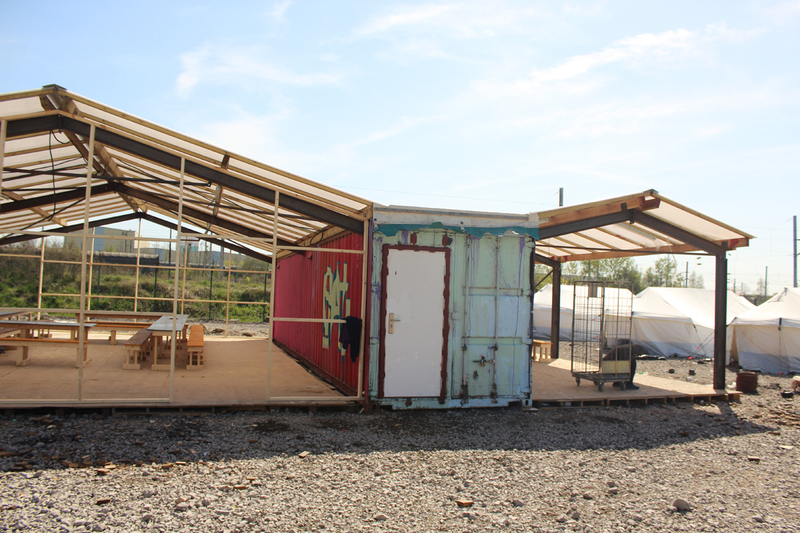 The way the camp came to existence is through a quite limited amount of money from the State that then delegated the design, fabrication and implementation of the camp and its infrastructure to Logistics Solutions, a French company whose website proudly accounts of its deal with the Egyptian army for one of its bases’ kitchens, and call the container camp a “container hotel for Calais’ migrants.” The organization of control, maintenance and administration of the camp was then delegated to another private actor, the association La Vie Active whose past humanitarian experience was uniquely related to work with elderly persons, as well as persons with disabilities. 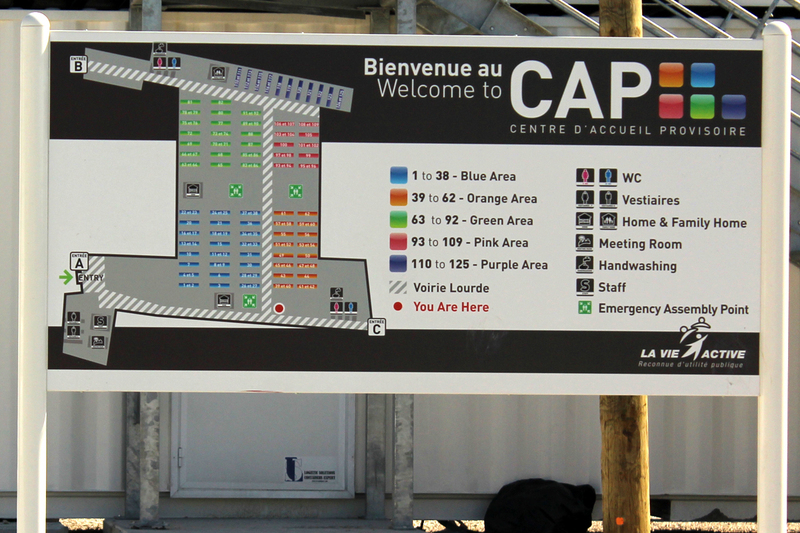 The camp is surrounded by a fence, counts only three access gates. 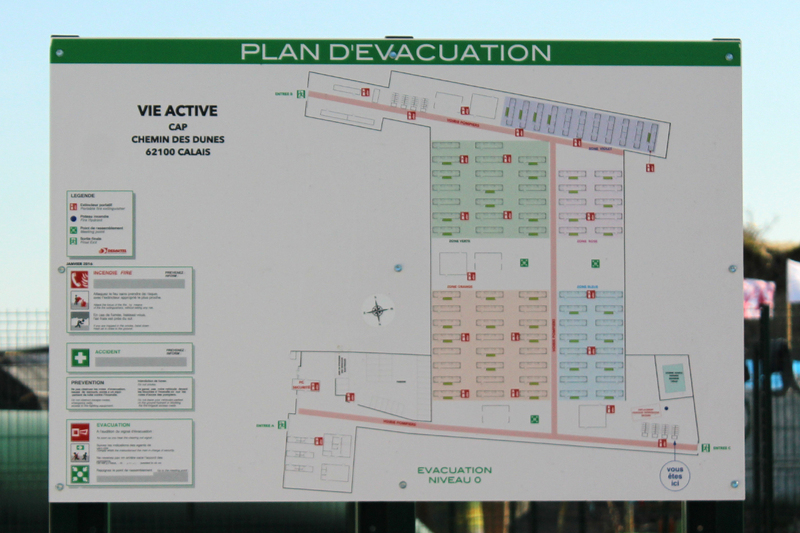 In this regard, the evacuation map (see photo below) in case of an emergency, by showing the little amount of exit points, also reveals the somehow carceral characteristics of this camp. The only regular access can be made through a small pavilion guarded both by police officers and private security contractors (the photos below that do not show the fence are taken from right outside of it). 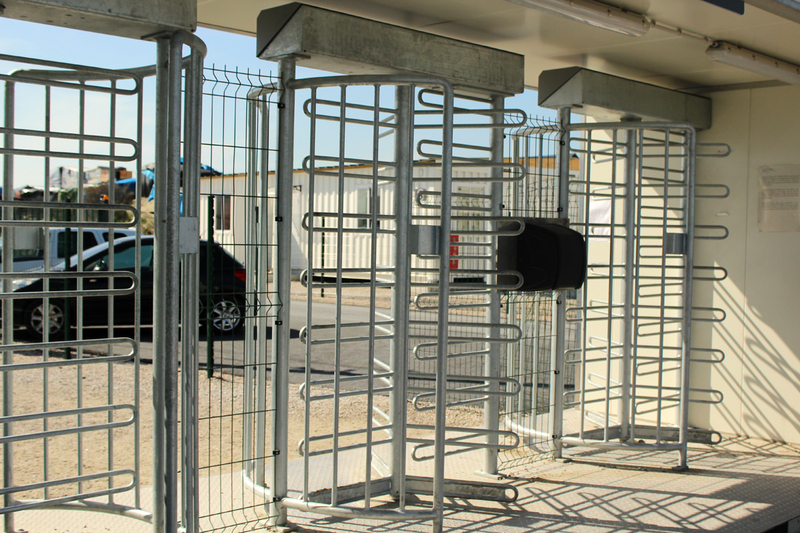 Once a registered person has been identified through a palm-recognition device (with all the problematic aspects that it represents when it comes to the Dublin Regulation), s/he can access the camp through uninviting turnstiles (see photo below). 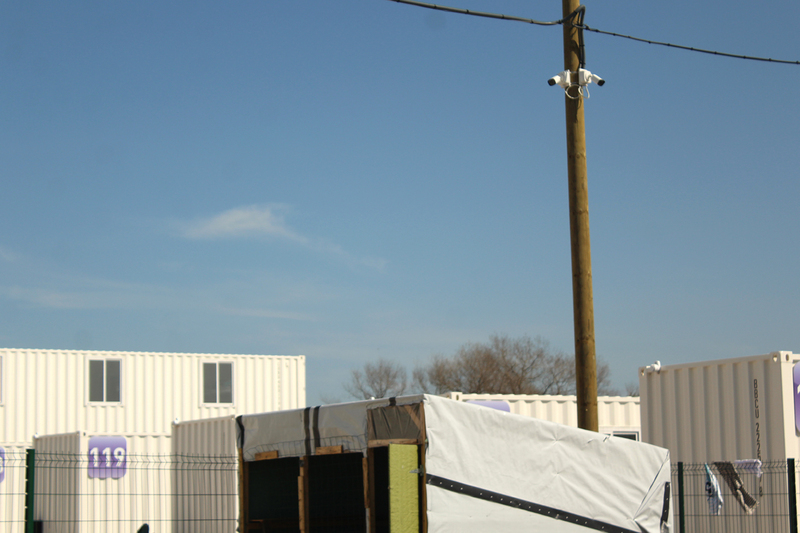 As written in the pasts article, the camp is built on a grid, easily monitored by the numerous (although discreet) surveillance cameras that populate it. 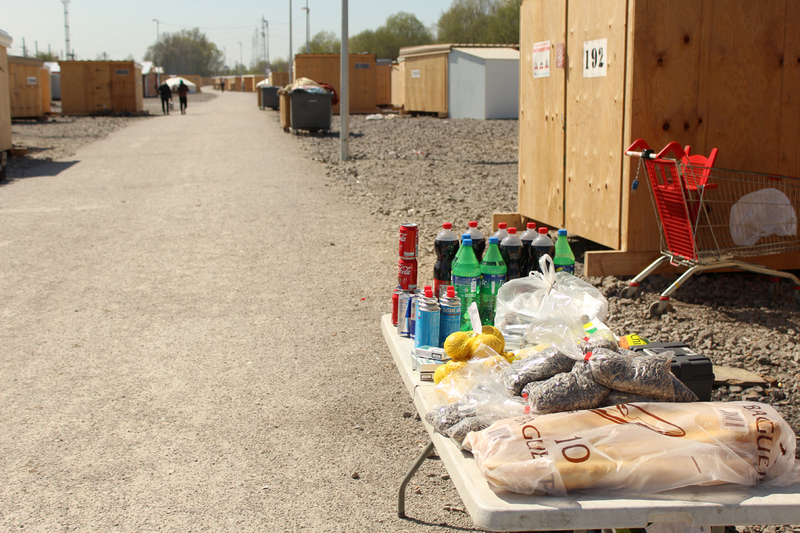 Any form of sociality is discouraged through space, as well as through rules forbidding cooking (food is provided by the association on another site, a few hundreds meters away) or practically practicing any other activity inside the camp. 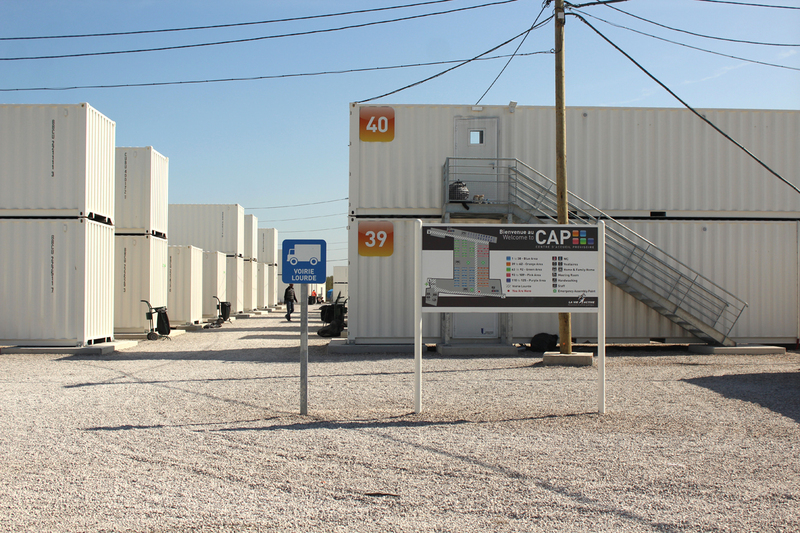 The infrastructure is minimal as the plans below attest: the camp is designed to temporarily (its official name, CAP means Temporary Hosting Center) provides a roof and restrooms to 1,500 bodies by parking them in containers traditionally use to park goods. 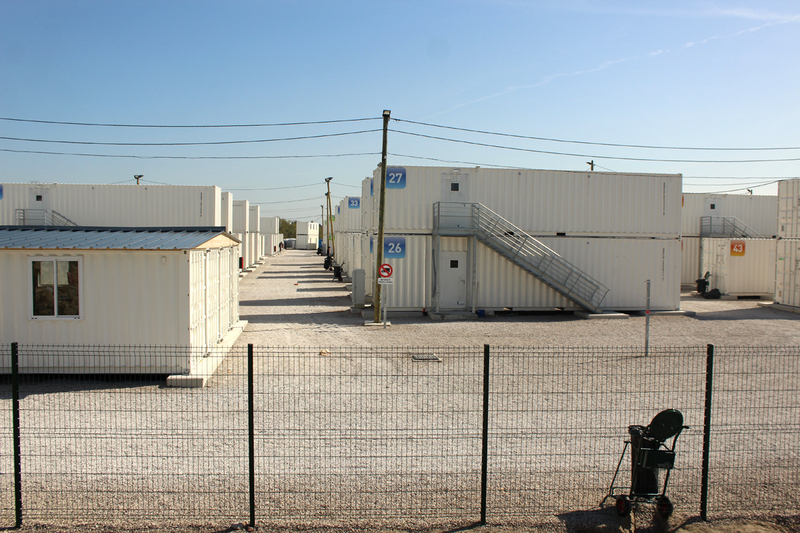 We should however not say that the camp provides the very minimum of the function we could expect from such a program but, instead, that the container camp deliberately scuttles its function in order to provide an ideological spectacle of the way the French State approaches what it keeps calling “the migrants problem.” The container object itself provides a “loud and clear” message equating the non-white migrant and refugee bodies to accountable objects to which we can add the symbol of the container that the State dreams to ship to other territories. All photographs by Léopold Lambert (April 2016) / All rights reserved (for the reasons explained above). 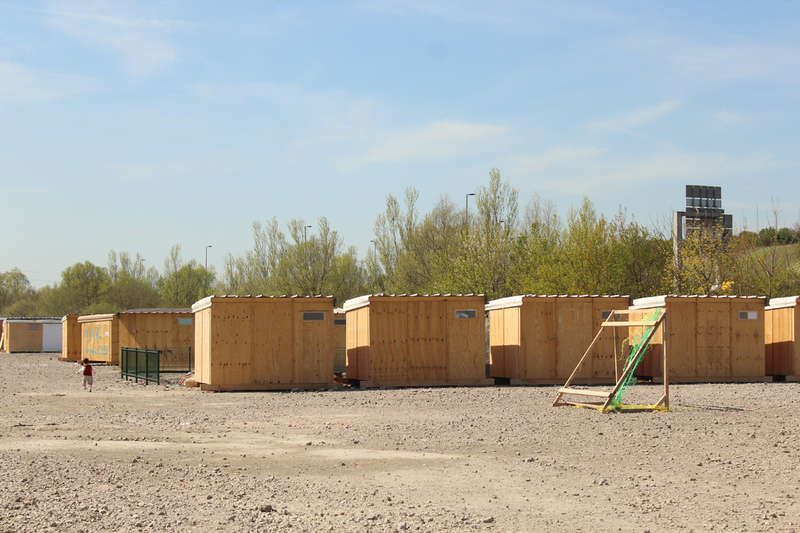 The makeshift dwellings of the Calais’ “Jungle” are only shown in their relation to the container camp here because I have not figuring out a non-voyeurist manner to show the rest of the piece of urbanity that the Jungle is. 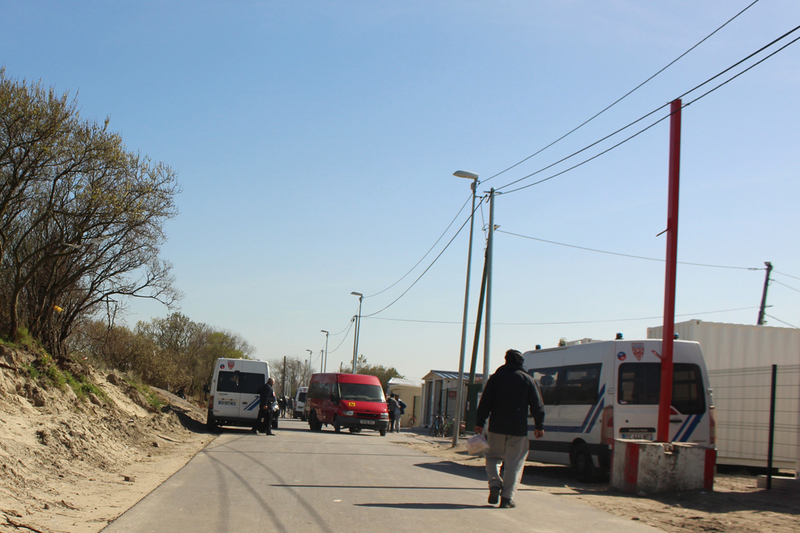 Although it also intends to host 1,500 persons, the camp opened in March in Grande Synthe near Dunkirk is significantly different from the container camp in Calais. 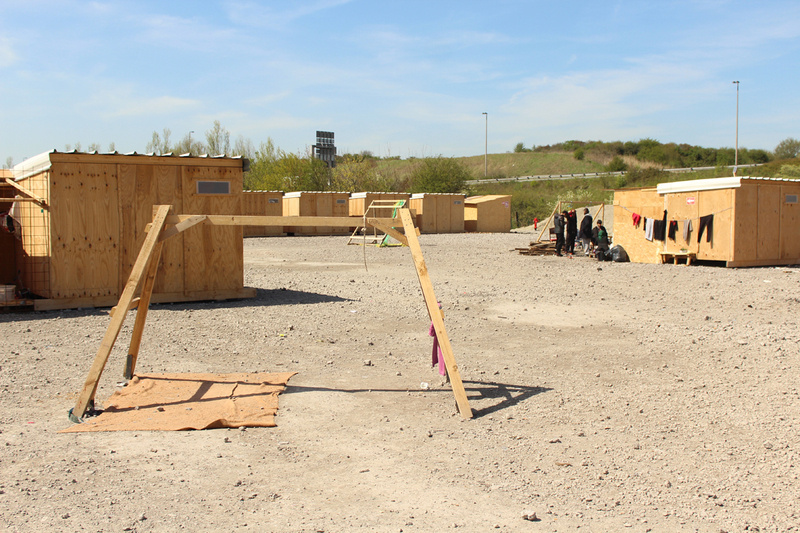 The Municipality (whose head is Green Party member, Mayor Damien Carême) worked with the NGO Médecins sans frontières (MSF), as well as the association Utopia 56, in order to organize a hospitable camp, independently from any participation/decision from the French State. 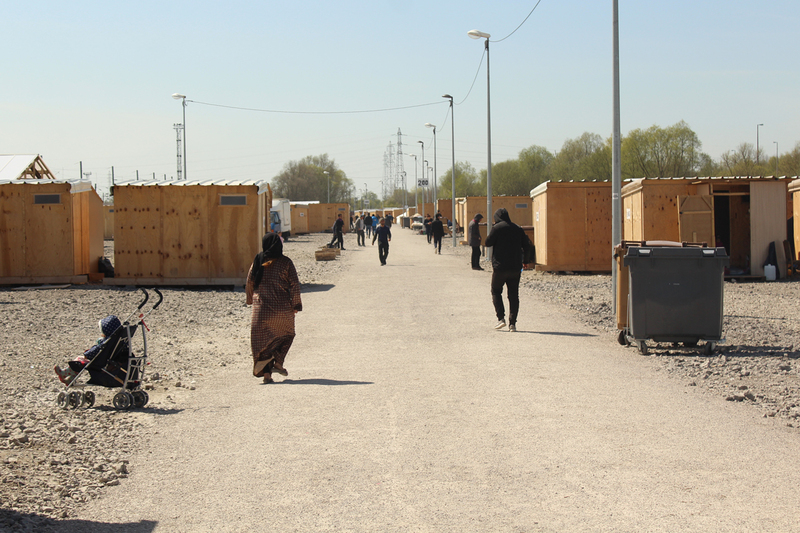 Although a few police officers are guarding both entrances of the camp and that volunteers make sure to control who is entering (and subsequently, probably leaving too) the camp, Merve and I were welcomed and authorized to walk in the camp without any supervision. The dwellings, designed for two or three persons each, are made out of chipboards with floors separated from the grounds. Various additions have been made on some of them depending on the needs of the residents. A person of Utopia 56 responsible of the camp’s organization insisted on the goal that consists in providing ideal conditions for a form of autonomy from the residents (communal kitchens for instance). Many have appropriated their dwelling by adding flags or graffiti, an important amount of which show the predominance of Kurdish people residing in the camp. 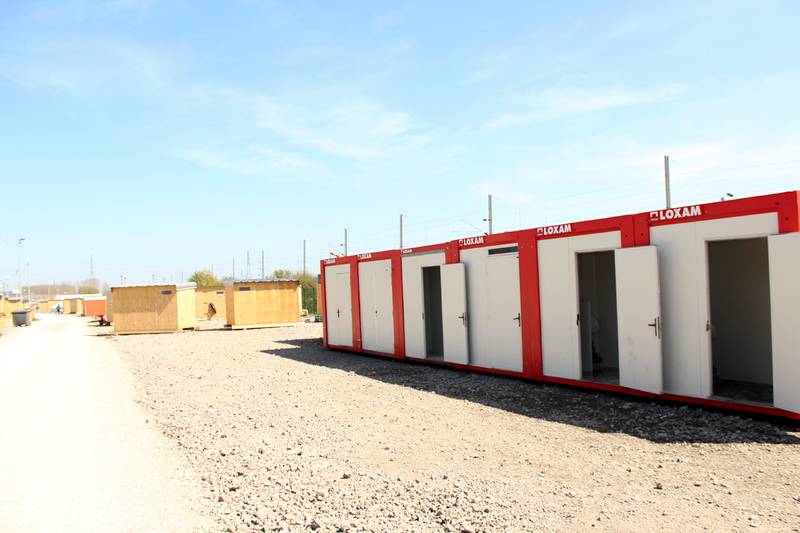 In addition to the restrooms, showers are also available, as well as an infirmary, clothing supply and laundry. 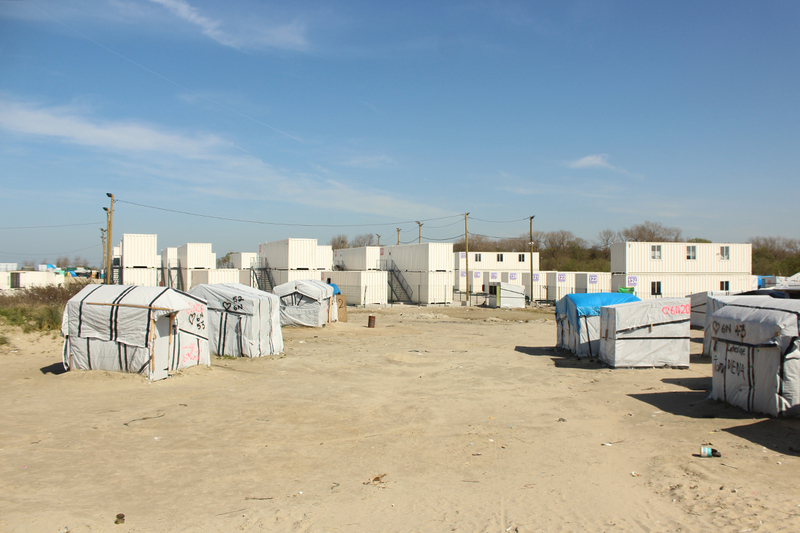 To many extents, the Grande Synthe refugee camp is therefore significantly different from its Calais counterpart: the political program materialized into an architecture here, involves a more local scale of governance and, as such, not only proposes a more benevolent intervention towards migrant and refugee bodies, but also allows the latter to organize themselves some of the conditions of their life in the camp. However, such a significant difference should not blind us in blatant problematic conditions in this camp that intervene at a larger scale of design. 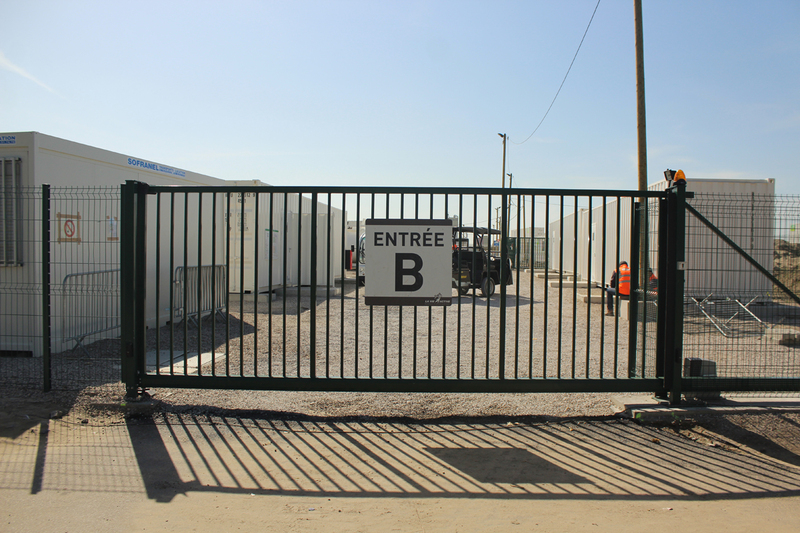 The site is not surrounded by fences, but it is tightly framed by both a loud highway and train tracks, preventing anyone to leave the camp from any other side than the two gates at its extremity. Similarly, the location of the camp fundamentally separates it from the rest of the town, on the contrary of the former site of encampment closer to the town center. Two pathways have been implemented for residents to gain an easy access to the neighboring shopping mall, as well as two bus stops. 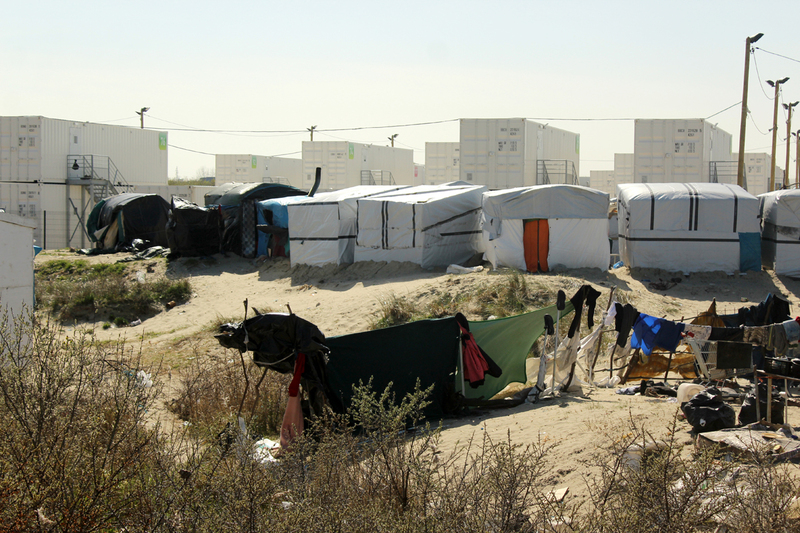 Although the conditions of life on the former camp were deplorable between the mud and the occasional assaults that some persons suffered from French nationalists, a young Bedouin refugee residing in the camp told us that he strongly regretted such a proximity. Although we can understand that it might not be easy for a mayor to find a parcel of land sufficiently large to host 1,500 persons, we can only observe how, once again, one of the necessary conditions of hospitality seem to be remoteness. All photographs by Léopold Lambert (April 2016) / All rights reserved (for the reasons explained above). Even more important than the specific aspects of the Grande Synthe camp that render it also problematic, we have to insist on its very typology: the camp. This is the fundamental common point to these two sites of (in)hospitality: they belong to the domain of architecture of control and to the genealogy of their typology that also includes its most deadly forms: concentration camps and gulags. Of course, such a comparison should not be made lightly and we need to strongly insist that there is a drastic difference between camps that embrace their carceral and deadly characteristics and camps that function to materialize a humanitarian program. However, it is also important to state that camps are fundamentally organized to control the bodies that live in it, regardless of the intention that motivate such a control. In the case of carceral camps, the intention is to ensure that bodies do not escape from them and are occupied to the role that has been forcefully attributed to them, while in the case of humanitarian camps, the intention is to count and organize the lives of bodies according to a humanitarian program. For instance, controlling how many persons are present in the camp allows the anticipation for supply in food, water, clothing, fuel, etc. In order to implement such a control, whatever the intent that justifies it, architecture (understood in the broadest sense as possible) materializes the organizational scheme through its physicality. 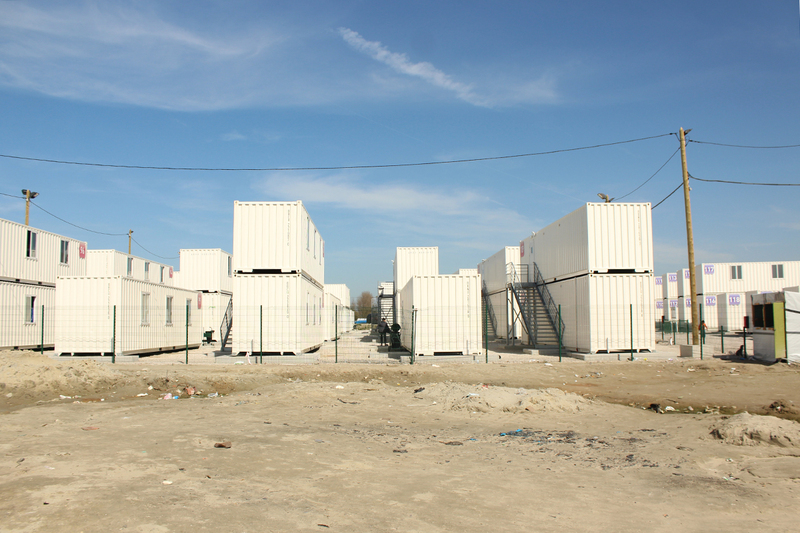 What is literal in the case of the container camp in Calais may be a little less so in the case of Grande Synthe, but is experienced by its residents’ bodies nonetheless. The typology of the camp, in opposition to the village, the neighborhood, or other veritable pieces of urbanity is doomed to reproduce such control on bodies that have no interest in being controlled. If there was one argument that would emerge from the totality of this blog’s numerous articles, it is that designing a fragment of urbanity that can be called a village or a neighborhood guarantees us in no way that its residents will not be subjected to a political controlling order. Yet, these typologies are not fundamentally dedicated to control in their very essence, they can simply become as such if they are designed and instrumentalized by political programs gaining from such a control. Just like for any other carceral program, we are left with two options: what we may call the Grande Synthe option that consists in genuinely (and sometimes successfully to a certain extent) attempting to soften the corners of a necessarily violent typology, or inventing/embracing alternatives to it.